The California Golden Violet is a plant of many names, commonly called the Wild Violet and the Johnny-Jump-Up. 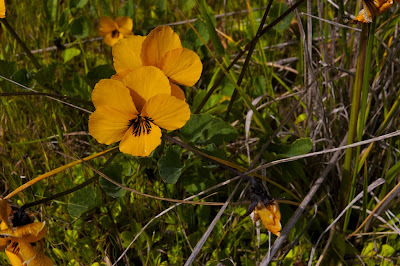 It is native to California and grows in grasslands below 3000ft, which includes almost the entire bay area. The plant is small, growing roughly ankle high (6"). It is destinguished from other similar flowers by its destinct violet-brown streaks in the cup of the flower and consistent 5-pedal spread. It prefers moist and shady areas but tolerates moderate sun exposure. It is commonly found growing near poison oak and valley oak groves. Look for them: in thinly populated oak forests, chaparall, and coastal sage scrub brush. You can eat the stems of those flowers... They taste like a cross between lemons and lettuce.